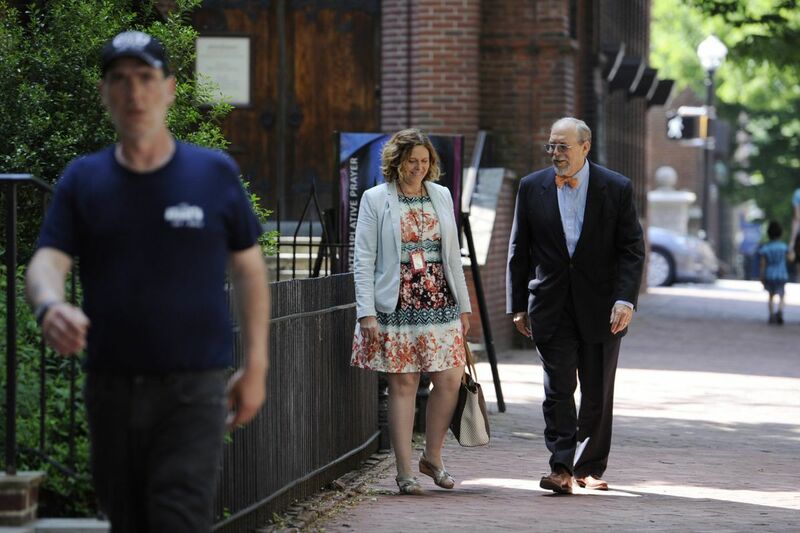 Lancaster City Mayor Richard Gary, right, and Lancaster Director of Public Works Charlotte Katzenmoyer opposed a plan to put dozens of small cell poles in Lancaster’s historic areas. Wireless carriers are pushing controversial legislation in Harrisburg that would give them nearly unfettered access to telephone poles, streetlights and publicly owned rights-of-way across Pennsylvania as they wire out cellphone dead zones and prepare for next-generation 5G services. The bill is part of a national trend by telecom carriers to make it easier to boost capacity on wireless networks for data-hungry smart phones. At the same time, many local officials are livid about the bill, saying it could despoil many towns' character and constitute "rights-of-way robbery." Backers say distributed-antenna systems, or an outdoor mesh of small cells about the size of pizza boxes, will bring many amenities. They could offer high-speed broadband internet services to compete with Comcast Corp. and other cable companies, experts say. State lawmakers in Illinois, Wisconsin, and Michigan also are considering "small cells" legislation. Telecom carriers have told Pennsylvania legislators that the proposed bill would streamline the latest wireless build-out so that they won't have to have file zoning permits for each new small cell, which takes time and can cost a river of permitting fees. But local Pennsylvania officials fear the proposed legislation could strip them of zoning powers over small cells. Hundreds of thousands of these cells will be installed across the United States over the next decade. "The goal of this is not to deal with [big cell] towers," State Rep. Nick Miccarelli (R., Delaware), a primary sponsor of the bill, said this week. "It's small cells that would go in existing structures, like poles and street lights." Many people in Pennsylvania "can't get cellular service, let alone these faster speeds. This would go a long way in rectifying these problems." Other Philadelphia-area sponsors of the bill. introduced earlier this year, are Reps. Frank A. Farry (R., Bucks), Gene DiGirolamo (R., Bucks) and Thomas P. Murt (R., Montgomery). Last month, a hearing was scheduled in the Pennsylvania House Consumer Affairs committee but then canceled. Farry said some towns appear to be "overzealous" in approving zoning for the small cells. But Farry added that the supporters and opponents need to find "common ground." Local municipal officials have balked at the bill in its current form, believing it would strip them of zoning authority over small cells that could include new utility poles in public rights of way. Those poles could be placed in historic areas or neighborhoods without local zoning, they warn. Lancaster officials have opposed a plan to put more than 70 small-cell antennas on big new poles in the city's historic areas. "The city would look god-awful with these towers all over," Charlotte Katzenmoyer, the city's director of public works, said earlier this year. The heads of the Pennsylvania associations for township supervisors, boroughs, and commissioners, as well as the Pennsylvania Municipal League, sent a jointly signed letter opposing the bill to its sponsors. Dated Aug. 7, the letter said the proposed legislation "is not in the best interests of Pennsylvania." North Wales, Reading, and other Pennsylvania local governments passed, or are considering passing, resolutions opposing the bill. Robert Lovenheim, a supervisor in Smithfield Township, Monroe County, refers to the legislation as "rights-of-way robbery" because it takes so much authority away from local municipalities. "We have to have some zoning control, but maybe not all zoning control," he said. "It's got to be fair on both sides." Lovenheim also is concerned about the long-term economic consequences of the small cells. He fears that municipalities could lose their cable franchise revenue streams if consumers migrate to high-speed wireless services offered by next-generation services such as 5G for streaming entertainment. The Pennsylvania legislation "strips municipalities of virtually all of their legal authority to regulate wireless towers and antennas," said Dan Cohen of the Cohen Law Group in Pittsburgh, which represents local governments in cable, wireless, and broadband issues. Cohen said that municipal officials don't fault wireless carriers for boosting capacity for the "huge surge in demand for wireless services." But town officials also want "to see orderly deployment of wireless broadband." Linda Kelleher, Reading city clerk, said Reading is not just concerned about 5G but subsequent new wireless services that could require even more equipment. "This time is not the last hurrah," she said of 5G. "You really need to handle these things with care. We don't think the utility company is the best one to make these decisions."